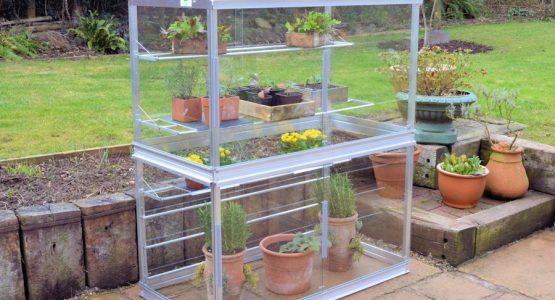 The Access Value Growhouse is one of the most popular models in the range, combining an excellent price with a sturdy framework and all of the benefits of growing under glass. Unique to the Access Growhouse is our sliding door system which allows a very large ventilation area when the sun is shining and very gentle ventilation on cool days. In addition the sliding panels ensure there are no hinged doors to flap and bang in the wind. By contrast, most growhouses and small greenhouses struggle when the sun comes out, as their limited ventilation options make it difficult to keep the temperatures down inside. In really hot weather the roof lights can be removed – ensuring the plants have wind protection while allowing the hot air to vent out of the top. The Growhouse is designed to stand anywhere – on slabs, concrete, gravel or even dug earth, all that is needs is a firm, reasonably level surface. The Growhouse can also be moved around the garden – close to the house during the winter and onto the vegetable patch or in a sunny spot on the patio in summer. Many growhouses have solid backs, cutting down on the light levels inside the growhouse. The Access Growhouse is glazed all round in toughened safety glass, maximising the light and warmth from the sun and resulting in earlier crops. All Value Growhouses are supplied with 3mm toughened horticultural glass – the same type of glass fitted to greenhouses but toughened for extra strength and safety. The toughening process ensures that if the glass does break, it shatters into small pieces like a car window. To quote the RHS “The best glazing material is glass, as it lets 90 percent of light through, does not degrade in sunlight and, unlike plastic materials, reflects heat radiated from within the glasshouse back into the structure instead of being lost.” It’s rigidity ensures that in high winds it will not blow out of the growhouse. It will also withstand 2′ 6″ (0.7m) of snow on the roof, making ideal for northern climates. Polycarbonate only lets 83% of light through and scratches more easily, further reducing light transmission. The hard surface on glass also makes cleaning easier, even after algae has been allowed to build up on the surface. The framework is manufactured from architectural aluminium, which is a mix of aluminium and other alloys such as magnesium and titanium. The frame needs no painting and is guaranteed for 25 years. All of the fixings are either aluminium or stainless steel. The framework is very strong and sturdy and is designed to withstand British winters. We sell a lot of units to customers in Scotland and the north Yorkshire moors. For very exposed locations we can supply a fixing kit to bolt the frame down to the ground. There are no lifting roof lights on the growhouse as these can catch in the wind. Instead the Access Growhouse has sliding roof lights to provide maximum ventilation. The Value Growhouse comes with 4 sets of seed tray shelves (two sets in the half Growhouse). The 4 shelves will hold 16 seed trays, but can also be used for small pots as well with the optional shelf covers. The seed tray shelves consist of slim aluminium bars to minimise shadowing. Each shelf is height adjustable and can be removed or folded flat when no longer required. In the early Spring all the shelves can be up, holding seedlings and young plants. As these are transferred to the garden or allotment the shelves can be folded down and taller crops such as tomatoes and peppers can fill the Growhouse.